A lid is certainly necessary if you purchase a few (recommended) 6 or 8 quart containers. This lid does the job and keeps your products fresh in the cooler. It also helps you stack the containers due to its slightly sunken profile. It just works!! First of all, any Cambro product ive ever bought has been awesome. They are totally indestructible. This is s good lid. Does just what a lid should. We purchased these and we really like them. They fit tightly on the containers that we got as well. No spillage, and they're easy to remove as needed. 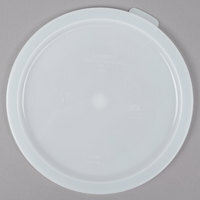 We will definetly be ordering more later on…..
We purchased this lid for the 8 quart food container. It's a good fit. The lid locks on tight and we are happy to have purchased it. If you are purchasing the handy Cambro round storage containers, you really need these lids. They fit perfectly. You won't have to worry about leaks in transportation. Also, webstaurant makes finding the right lid easy, just folloe the suggestion on the product page. Cambro RFSC6148 6, 8 Qt. White Round Lid fit perfectly the Cambro RFS6148 6 Qt. Round White Food Storage Container . The lid is air tight. Great price. These are great if you couple with another order to save on shipping. This is a great price on cambro wear and this site is pretty much the only place I order it from. When paired with the 6 quart Cambro food storage container, these lids work great! Just be sure to get the right lid the with right container as even within the same brands, some lids do not fit on certain containers of the same size. Great price for these! None of them were damaged when we received our shipment which is great! Fits perfectly, no issues with compatibility with the container. These lids are nice and tight, fitting the workhorses of our kitchen, the 4 and 8 qts. I use these very regularly and have no complaints. Works great with the Cambro Food Storage Containers. We originally purchased some off-brand ones and the lids wouldn't stay on at all. I definitely recommend spending the extra money on Cambro Containers. Ordered these lids for our 8 qt containers, very sturdy & durable. Seals great, had originally ordered the wrong ones & the return & exchange was very simply & quick. Quality excellent, size perfect, delivery super fast, package well done and the most important thing the price. Nobody have this price. Webstaurant is the company that we need for our profession. Don't forget this lid when purchasing the Cambro RF56 6-qt. Round White Food Storage Container. These containers and lids are must have for storage and/brining! These lids by Cambro do what they should and haven't failed yet despite me dropping them from time to time. All in all these are well made and tight fitting even after a lot of washing. The price is the best you will find anywhere and the lid is top quality. Snaps snugly into place and fits on other containers not made by Cambro as well. we use the Cambro RFSC6 6, 8 Qt. White Round Lid with the matching containers. these are easy to clean and fit pretty tight to the container. I always order one more lid than container. Don't know how it happens, but one of the lids always disappears. I am glad that you can buy these individually so if I order 6 containers, I can get 7 lids. Glad there is no pack size. Just your run of the mill storage container lids but the prices are better than anywhere else on the web. Thanks for such a great product.